Wiremapping is a simple test that confirms that each wire is hooked up correctly, with no opens or shorts. UTP intended only for POTS (plain old telephone service) voice applications actually only needs to be tested for wiremap. Wiremapping is very straightforward. Structured cabling standards do not consider simple voice grade cable, only cable of Category 3 or above, so most cable testing will require more than just wiremapping, either certification or verification, so wiremap testing is done in the tester before other tests. Each pair must be connected to the correct pins at the plugs and jacks, with good contacts in the terminations. 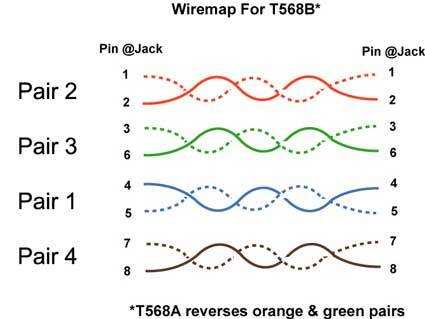 A "wiremapper" is basically a continuity checker that determines if pins are correctly connected. Most of the failures are simple enough to understand, like reversed wires in a pair, crossed pairs, opens or shorts. One possible failure, crossed pairs, is caused when both wires of a pair are crossed at one termination. 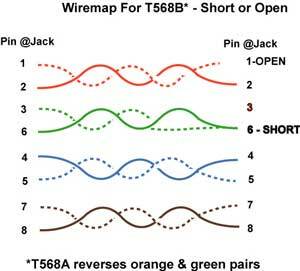 The usual cause of a crossed pair is a 568A termination on one end and a 568B on the other. 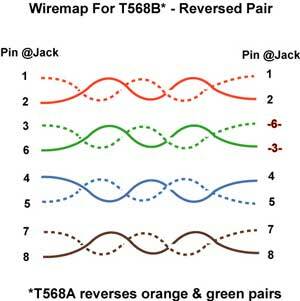 The most difficult wiremap problem is a split pair, when one wire on each pair is reversed on both ends. It causes the signal to be sent on one wire each of two pairs. The usual DC wiremap will pass but crosstalk will fail. It takes a more sophisticated wiremapper or Cat 5e/6/6a tester to find a split pair, as some wiremappers which use only DC tests do not check crosstalk. In our experience, a split pair is usually caused by someone using punchdown color codes on jacks which splits the pairs. Here are examples of wiremap faults. Compare the diagrams to the correct one above to see the wiring errors. Shown here, pair 2 (orange) is open because tip is not connected. Pair 3 (greeen) is shorted on pin 6. Pair 3 (green) has tip and ring reversed. Pair 2 (orange) and pair 3 (green) are crossed, connected to each others pins. 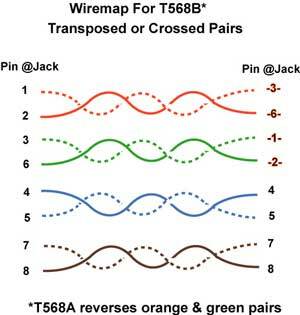 The usual cause of crossed pairs is one end is terminated at T568B and the other end T568A, where pairs 2 and 3 are reversed. 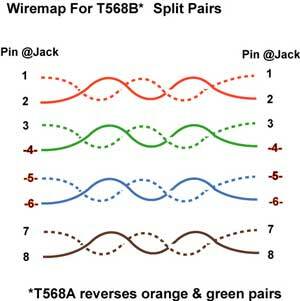 Split pairs are when one wire of each pair is improperly connected. Here pairs 1 (blue) and 3 (green) are connected such that a DC wiremap tester will test OK, but the signals are being carried on one wire of two pairs, so the cables are unbalanced. Split pairs are often caused by the wires being punched down on a jack using the color codes for punchdown blocks.